Love the picture. You look absolutely fabulous!! Best of luck, hon! Now that my wife knows about Sally, I'm hoping we can maybe work in a trip next year. By the by, Paula Howard, TCNE's Prez will be down there Wednesday talking about our little group. She's a delight if you happen to bump into her! 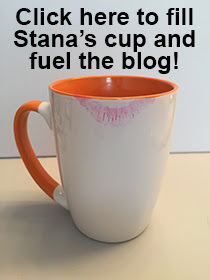 Have a wonderful time Stana and let us know how it goes, you have a wonderful writing style and wit and it will be a joy to read your perceptions.